Product Review: Maybelline Eye Studio Eye Makeup Plus Giveaway! I like to dabble with eye makeup even if I'm far from being an expert at applying it. Truth be told, I ogle the huge multi-coloured eyeshadow palettes and covet them for their potential for limitless looks, but deep down I know I'd end up using the same five shades repeatedly and barely touch the others. It's this rationale that's kept me from splurging on more eye makeup. So when the folks at marketing company Matchstick contacted me and offered to send me a train case chock full of products from the Maybelline Eye Studio eye makeup line, my curiosity got the better of me and I said yes. The Eye Studio Colour Plush quad palettes come in 12 different varieties. Each palette is colour-coordinated so that you can wear the shades alone or all together for the ultimate dramatic look. Although I liked the colours, I found the formula very difficult to work with. It was powdery and migrated to different areas of my face instead of staying put on my eye. The shadow is quite sheer, so you have to apply a lot to get the same vivid colour you see in the case. Stick with smaller eyeshadow brushes and definitely use a good primer. The Eye Studio Colour Pearls duo shadows were very bulky to store compared to the quad palettes and they didn't have as many colours in one case. Like the quad palettes, I found the formula too powdery, not pigmented enough, and very difficult to work with. Although the eyeshadows were disappointing, the XXL Pro 24Hr Bold mascara in Very Black was great. One end of the wand lengthened lashes while the other end boosted volume. The formula was pretty smudge-resistant even through a sweaty night of salsa dancing. Likewise, I really liked the Eye Studio Lasting Drama gel eyeliner in Blackest Black. It was my first foray into gel eyeliner and I was impressed with how bold and smudge-resistant the line was, and how easy it was to apply. The eyeliner came with its own brush, which was nice. In fact, I liked the mascara and eyeliner so much that I'm giving away the ones I didn't use. One lucky reader will receive 3 XXL mascaras and 3 gel eyeliners in brown, charcoal, and purple. This giveaway is open to Canadian and American residents. To enter, simply leave a relevant comment on this post. (If you don't have an online account under which you're commenting, please provide an email address as well.) The giveaway ends Monday May 17th at midnight. Good luck! P.S. Stay tuned for my next post in which I show you some of the looks I put together with Maybelline Eye Studio! I live outside U.S and Canada, so good luck to the people who can get the prize! This giveaway was made for me because I only use mascara and eyeliner for my eye makeup. Since I now have bangs, I don't bother with eyeshadow because you can't see it. Gel eyeliner is my new faveorite product, although I still use eyeshadow as a liner because the combination of both has much more staying power. ahhh...i'm on and off with eye make-up. it goes in phases: i wear it one year, then stop completely the next...that said, i have lots of OLD eye shadows in my drawer. I love to play with makeup! This would be so fun! I have been eyeing the ads for the gel eyeliner and thinking of taking the plunge - I'd much rather win them, though! I'm excited to see the looks you put together! I have a hard time with a lot of eye shadows, you should check out GOSH out of Denmark's eye shadow quad palettes, I have never ever ever had a single problem with them, and I think you'd love the natural tones for blending. Great review. I used to not care about makeup until last summer when I started my fashion and beauty blog. Now, I LOVE MAKEUP, I have learned so much about brushes, techniques etc.. that I would love to win this! I think your post has been truly honest and informative about this new product! A lot of other bloggers got the chance to try them out and loved them all but yours actually describes what works and what doesn't! I would love to try the products! Cheers! I love gel eyeliner! Thanks for the giveaway! I hate a lot of drugstore brands of eyeshadow. They are only OK for day to day wear and never for looking nice. That is why I generally use Ben Nye for interesting makeup -- for theatrical makeup it's very cheap and it comes in every single colour of the rainbow. In first year I got a 12-color pallet for 100 dollars. For 4 years I wore that makeup pretty much every day (in various looks) and I have only used up 1 color (Iced Gold, the best base colour ever). And you can get refills for about $12 to $15, or larger singles for colours one uses a lot for about $15. It's good stuff. I would love to try some gel eyeliner -- I am not particularly happy with the liquid liner I normally use because it's too flaky. Found a good alternative with a stupid fat applicator. Anyway, one tip to make the most of the pigment that does come in drugstore brands of eyeshadow is to apply with water. That can get you pretty close to looking like it does in the pallet, but runs the risk of falling around your face. This weekend I tried a primer -- http://www.thebodyshop.ca/skinprimermatte.html -- works great to prevent creasing. And somehow manages to minize the amount of pigment that un-attaches from my eyelids after applying (with water) -- I use anabelle pigments for my day to day look and when it dries it detaches and lands on my glasses and is ... bad. But the primer has somehow helped, which I did not expect. I always try hairspraying it into place which will probably just give me corneal cancer or something. Have you tried any cream shadows? I want to try them but they advertise as "sheer" and I do not want sheer eyeshadow. And I wanted them to see if they might help with the creasing but having solved that I guess there's no reason to try them. So if you get sent any please let me know how they are! Sorry the shadows didn't work well. But glad to hear that the mascara and the liner was good to use. Hey, how about a tutorial for us eye liner challenged?? Hi Lisa! It's only my 3rd moth here in Canada and I started looking for blogs..... luckily I found yours! As a new immigrant your write ups help me a lot to get updated with everything here in BC! From make ups, to recipe to accessories! I love checking out your outfits now and then because I get inspiration from you! Getting adjusted here is way easy with Solo Lisa! Hope to win this prize! Hmm I've never gotten a hang of using gel eyeliner. It may be worth another try! I would love to try the mascara. I have oily skin and have not found a good mascara that would not give me panda eyes after a couple of hours. I use mostly makeup to cover and to make a visual illusion that my skin is perfect and even...The mascara is a must, but less is always more! The eye liner I use also carefully, especially on the lower lids. My favorite must-have is consealer. I would love to try gel eyeliners! really would love to try these products , been hearing great reviews about them. 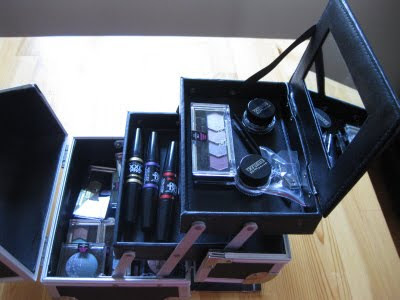 i have the lilac quad myself and i love it cause it's very buildable and very versatile for different looks. Ooh, yes please! I've never tried gel liners and this would be a great opportunity to do so. I've heard quite good reviews of Maybelline's Eye Studio Gel Liner, too!